The one thing that probably wears me down more than anything else as a mother is bickering: petty arguments and their results. "Maaah-meeee, he hit me!" I used to feel like a referee! I began to see that I was also encouraging my children to become gossips as they constantly reported their grievances to me. We knew there had to be an answer! So we started digging into God’s Word. Here it is in a format that even a toddler (or adult) can understand! 10 Scripture-based guidelines for parents when they must assume the role of judge in offenses. Includes a chart outlining steps for both parties, with Scripture and cartoon drawings, and a 28 page booklet giving further directions, ideas, and verses that apply. 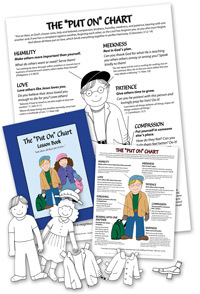 The booklet material can easily be incorporated into your family worship time. Scripture can help bring peace to your home! 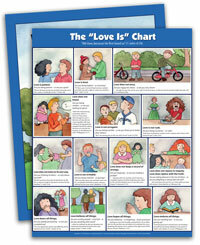 The chart is available in a color, smaller, laminated format, or as a large, full-color poster (unlaminated). Scripture quotations come from several translations including the NKJV and NIV. 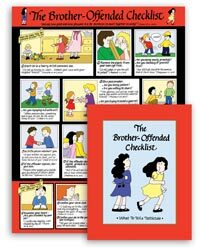 My husband and I have been using this resource for the last five years with great success to solve sibling conflicts. Public schools try "conversations" to stop bullying and gossiping, but they can not shepherd the heart. This study helps shepherd your child's heart, guide them in love, shape their character and make needed changes. Also, it is the missing piece if your parenting is punitive and focused on behavior change only--- it helps the children look at their heart, examine themselves, and change their attitude before they come to parents/teachers. This has become a welcome tool. I've hung the laminated version on our pantry door and my p/ks often ask me to read what the captions are to the pictures, which has led to some good discussions. When first hung I found my elementary student reading over it a number of times as well. It has been one resource that has gotten consistent use primarily because it has encouraged me to go from reactive to really helping all of us consider the many aspects of being or having offended. Very handy. Shows what the proper response is when a problem arises between siblings. 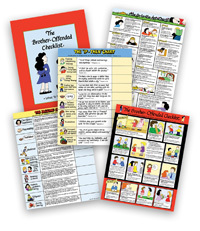 The Brother-Offended Checklist is so helpful in teaching biblical ways to deal with conflicts. Some of the information was new to me, as I did not learn about this at all growing up, so this has benefitted our whole family as we seek to serve Him! This chart made a big difference in teaching our children how to work things out between themselves instead of tattling on one another. What a great tool! Nothing beats Scripture! 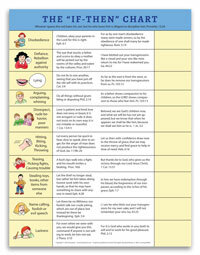 Little did I realize God would use this little chart to train "me" while I was using it to train my children. That they would watch me walk through these biblical steps in my own life. What accountability! I found my heart recalling these Godly steps as God brought circumstances into my life, where I humbly had to examine myself and submit to Gods leading... while their little eyes watched. I believe these charts are great instruction tools and can be easily understood and used by our children and Gods children of every age! Thank You!